September 2016, LONDON – Research results released today by BlackLine, a leading provider of finance controls and automation software that enables Continuous Accounting, reveals that while accountants play a much larger role in achieving business success than previously believed, accounting departments overall are under-valued in their role to the business, with over one-third (34%) of respondents accepting that their financial teams are an underutilised resource. 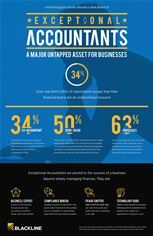 The survey, conducted with UK business decision-makers at medium and large enterprises, also found that many business leaders recognised the value that finance teams brought to longer-term business strategy – if faced with an economic downturn, around a third declared they would rather an ex-finance chief (34%) or ex-accountant (27%), run their business – over an ex-salesperson (13%). Even in a growing economy, more than three in five (63%) noted that sound financial and accounting processes and systems are the most important elements of well-managed growth. Whilst nearly one-third (30%) of business decision-maker respondents in BlackLine’s survey lauded their finance teams for contributing to the growth of the business beyond their role in financial management, the survey also found that finance teams can often get dragged down by time-sensitive reporting and month-end processes. Half of the business decision-makers surveyed noted that they felt their financial teams typically have an overly taxing volume of work. Accounting is the most common career background of FTSE 100 CEOs according to the latest Robert Half FTSE 100 CEO Tracker, with almost one in four company bosses holding a chartered accounting qualification and 55% of chief executives coming from a finance background. Through Continuous Accounting, Exceptional Accountants can continually capture, validate and produce financial data throughout the month, to work in ‘real-time’ instead of in peaks-and-troughs. Implementing a continuous close function also enables a more accurate measurement of business progress, allowing underperformance to be quickly identified and corrected. This reduces ‘time to insight’ and accelerates ‘time to decision’, empowering Exceptional Accountants to gain more time to add strategic value to the business.